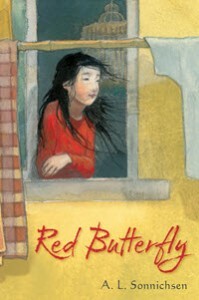 kt literary » Blog Archive » Happy Book Birthday to RED BUTTERFLY! Happy Book Birthday to RED BUTTERFLY! With spare, fluid language, she creates the endearing, authentic, nuanced emotions of a girl stuck between two worlds and brings to light a foundling’s hope and determination. An adoption story that’s rich in family complexities and that readers won’t abandon. Sonnichsen creates a palpable sense of yearning for home and belonging (“I want to explain, but/ I can’t make my mouth form words./ How a place so beautiful/ can make me feel so sad”) in this heartbreaking, heartwarming, and impressive debut. It was such a crowning moment to see the book so prominently featured at the Simon & Schuster booth at ALA Midwinter this past weekend. And as another story of a young girl told in verse captured the hearts of librarians, so too I hope will Red Butterfly! Congratulations, Amy! And did I mention its a PW Pick for Book of the Week? Yay!